HT is Horticulture Therapy for me. 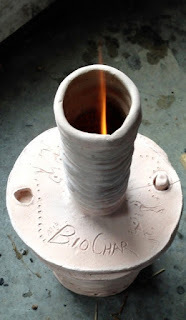 It works as does biochar! No pesticides or chemical fertilizers in use. Early July versus early August in pictures. Zucchini plant is the biggest I have ever grown and starting to produce well. 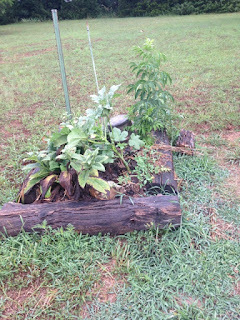 That is a 4 foot level sticking up near the middle of the plant. The Zucchini died off quickly during the July heat wave. Pulled it and seeded cilantro in the open space. 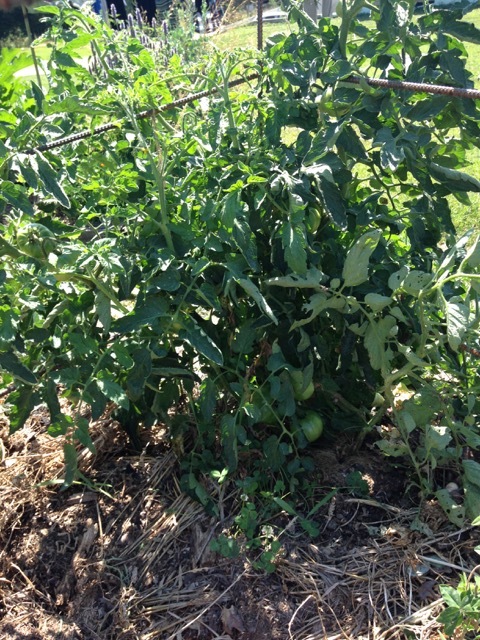 Early July, about waist high, starting to set good, none vine ripened yet. 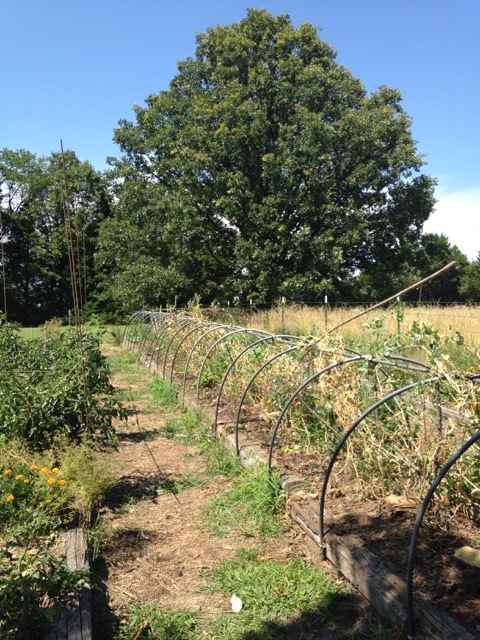 Early August, still picking below the waist line, vines have reached about 7', plenty of fruit setting. 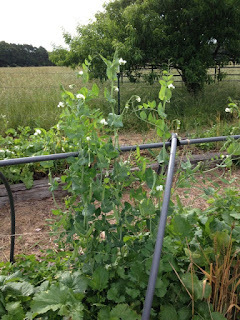 Still picking snow peas in early july, yum! Had just pulled the last of the turnips before this picture. 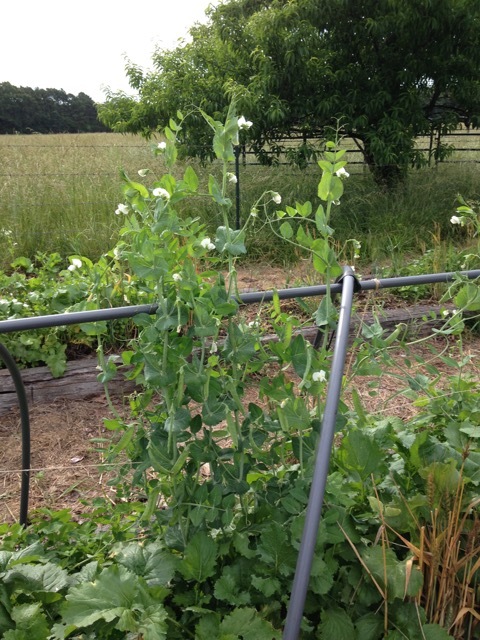 August, snow peas long gone, had a few sweet potatoes started, sowed beans and cilantro just before about 5" of rain came in the last two days. Good timing! Also corn is off to a good start in bed 3 to the right in the picture above. 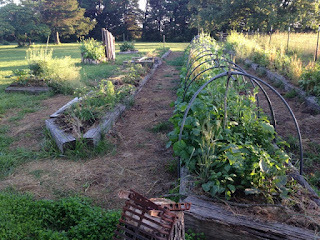 July in the far east bed, lettuce was mostly finished and corn was planted. 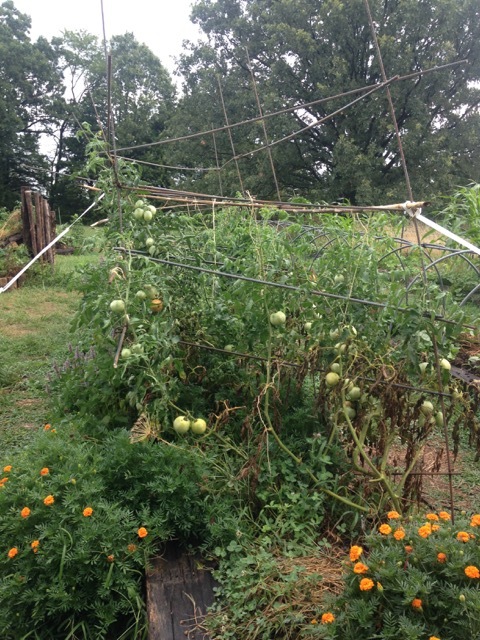 A toad skin melon is working it's way along in the middle of the bed. This view is from the North. Early August in bed 3 the corn is off to a really good start. About 5" of rain in the last two days but a little wind with it. Wind is hard on a two row corn planting. 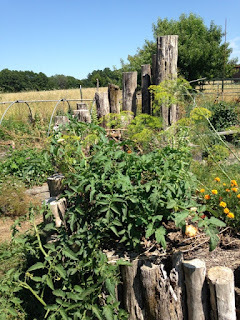 July, dill is building big heads, yarrow is going nuts, golden oregano is doing well. 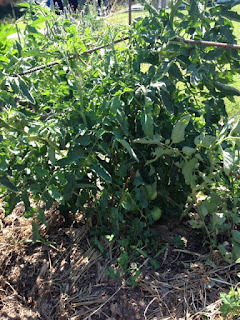 A tomato planted from a sucker is starting to take over the N side of the bed. Maybe should not have done that. August the dill is done and gone to seed. Thai basil seems to have found some roots and is finally growing. 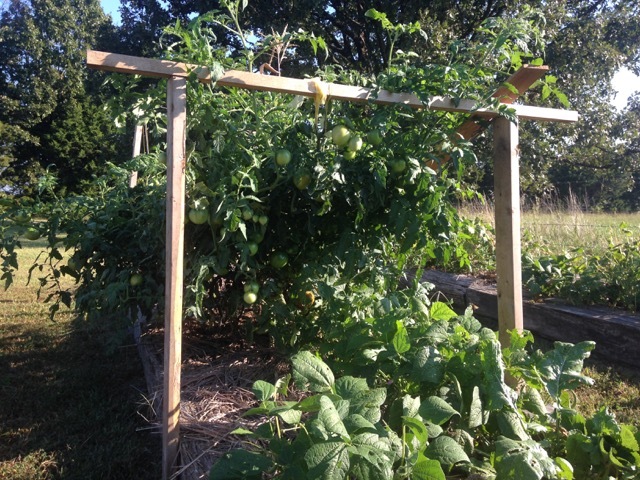 Tomato is really starting to produce, lots of fruits. 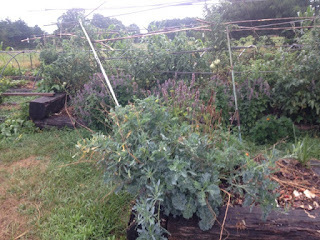 Kale with hyssop just behind it. Both are in their second year. The kale is making lots of leaves and seeds, but making the seeds over an extended period of time. 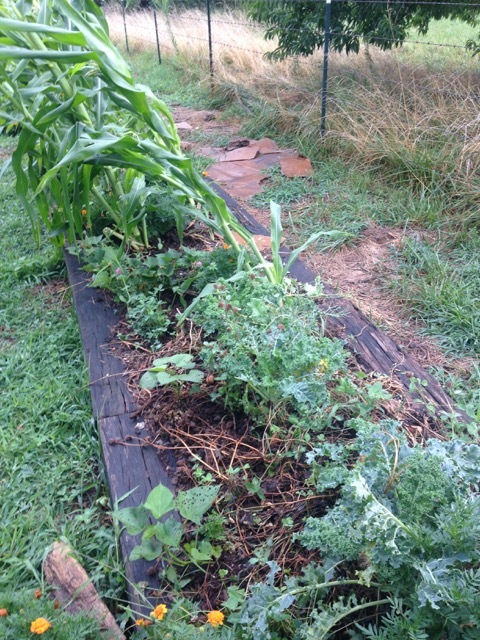 Been planting kale seeds in all the other beds as they mature. Kale is still making seed a little at a time, still edible leaves in August, unusual method of seed production compared to what is commonly experienced. 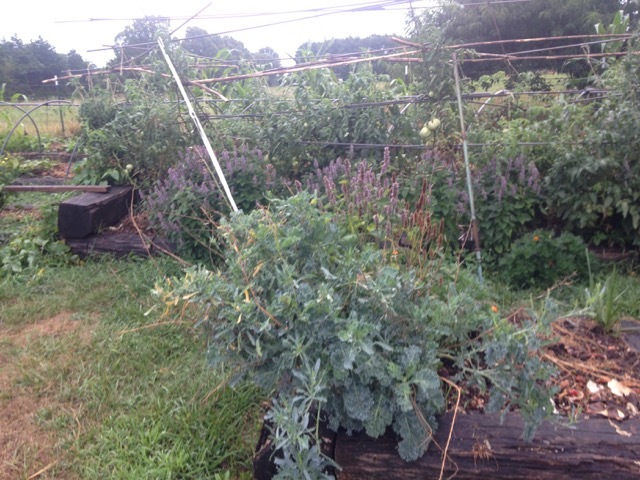 Kale-hyssop may be a useful combo? The single hyssop plant seeded well last year, with several new plants emerging along the outside edge of the wood border in the tomato area. The fresh hyssop blooms brings in LOTS of bumble bees, a few hummingbirds, a few japanese beetles, but as yet still no honey bees. 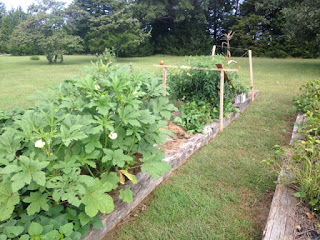 Had planted quite a bit of okra but none seemed to want to sprout. An okra plant is starting to grow pretty well in a small test bed. 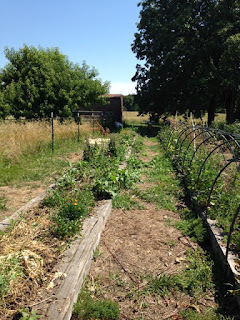 Comfrey doesn't look like much, but harvested quite a few leaves just before the hot spell set in through July. That probably did not leave enough shade for the roots. That is an elderberry in the background. 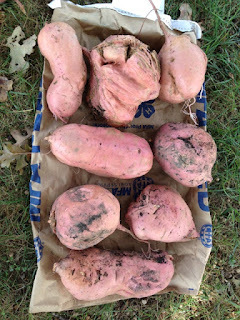 Plenty grow wild around here but wanted to get some started near the house. Hugelkulture Herb Bed Spiral in pictures. 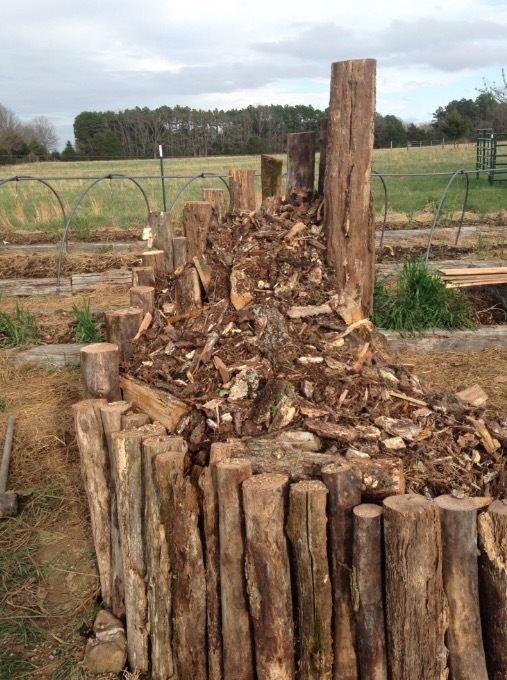 Had quite a bit of decayed wood from cutting dead trees for winter heat. The decayed outer bark and wood were split off the dead heart wood. 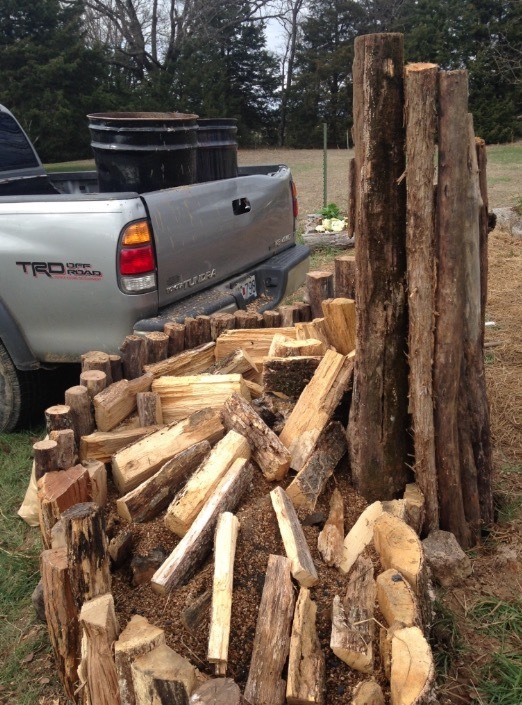 Ended up with about a 1/3 cord stack of decayed wood from the winter heating season. 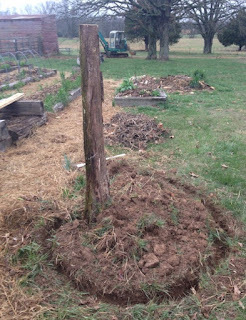 There was a fair amount of dead pole timber lying on the ground where the dead trees were harvested for firewood. All came from a mostly oak forest turning toward old growth. 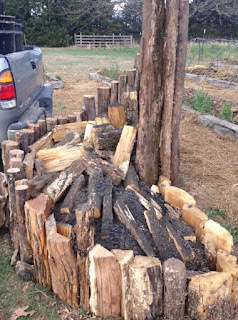 The idea was to use the pole timber in fort style for support, and the decayed wood inside "the fort" to prevent the bed from quickly "slumping" downhill. 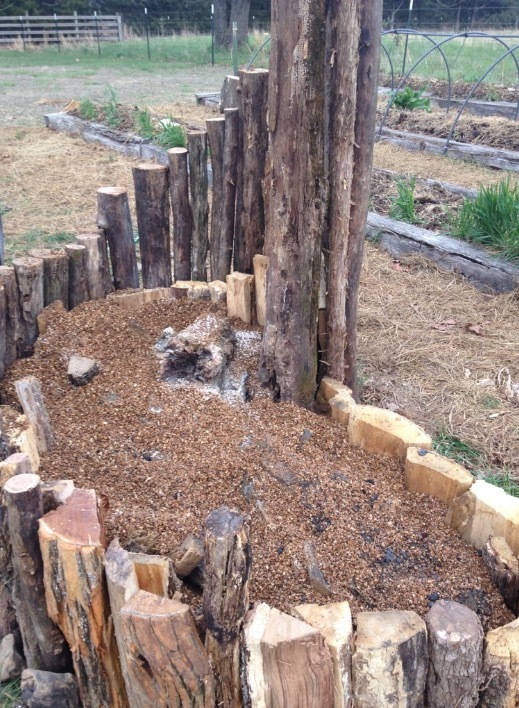 About eighty gallons of river pea gravel, an accumulating "waste product" from a local rock and gravel operation, was used to fill the voids and hold the decayed wood in place. 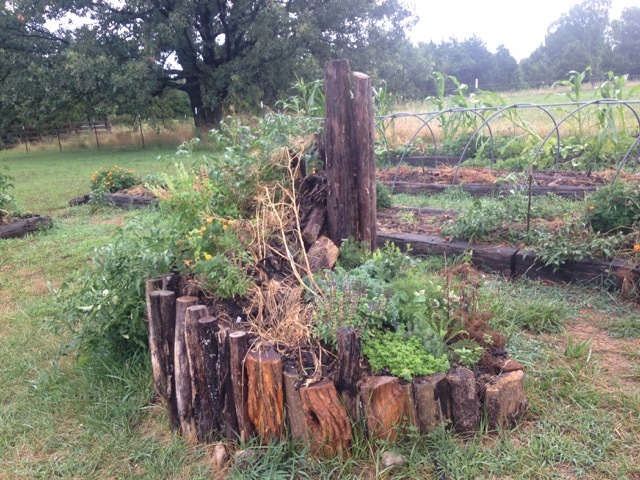 Pea gravel is at least as good as decayed wood for holding moisture. The sandy soil from digging the trench for the fort poles is the first ground contact layer. 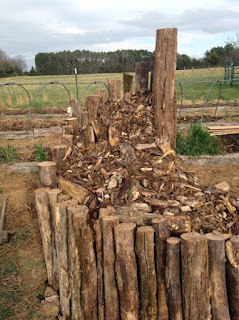 From there, in order of ingredient volume, it is decayed wood, pea gravel, biochar (another excellent moisture grabber that retains bulk), Global Harvest soil rejuvenator, cal-phos and Sea-90. Then on top a sprinkling of bark from the log splitting, newly emerged grass, and composted horse manure. Herbs were then seeded, with a few native herbs transplanted from their native habitat on top. How will it work? Will it slump? Will it grow stuff with little watering? We shall see. 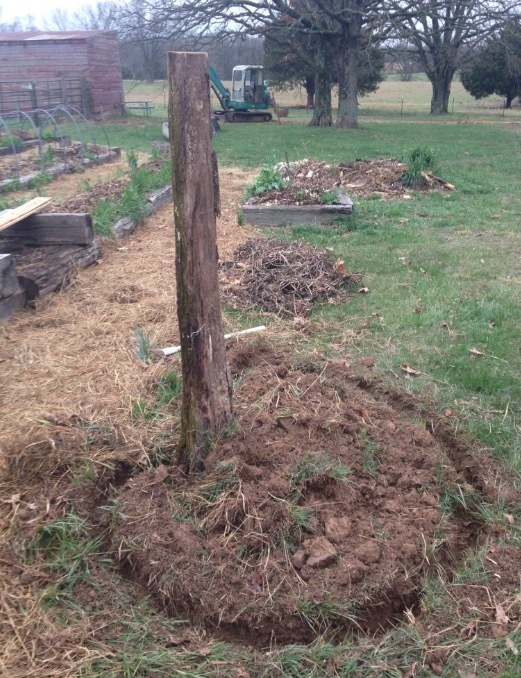 Laying out the spiral from the centerpiece pole.. 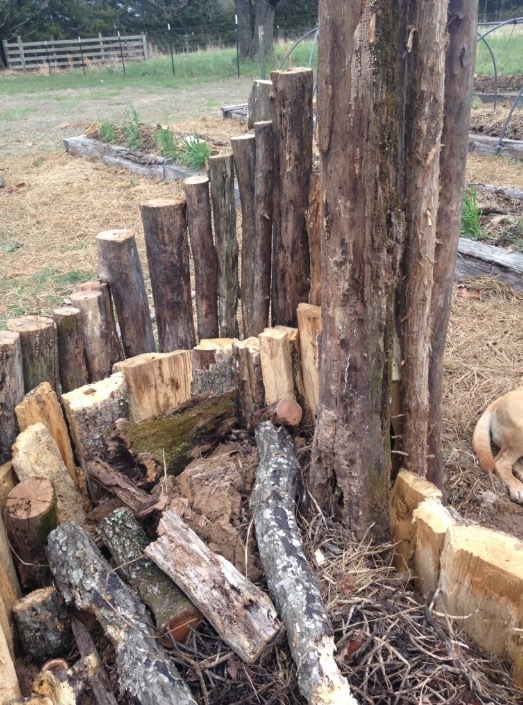 Installing the "fort" logs in the trench.. 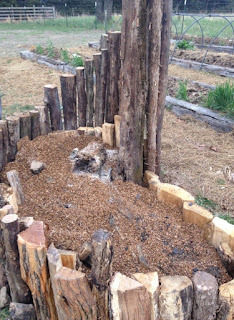 Excess from fort logs is next layer above excavated soil..
Then some cal-phos topped with biochar..
Then the first layer of pea gravel..
Next more biochar mixed with Global Harvest Organics soil rejuvenator (for microbes + composted manure)..
Then more pea gravel and more decayed wood..
Then more biochar mixed with soil rejuvenator, cal-phos and Sea-90..
Then several buckets of bark that had been laying on the ground through the winter..
Then a light sprinkling of biochar and soil rejuvenator mix followed by a top layer of composted horse manure mixed with fresh spring grass..
How well or poorly will this work? We shall see..
NEWS FLASH: Brushape solar collection and storage systems are currently up and running worldwide! Trees, sprouts, stalks, cobs, pits, hulls, and our favorite fuel "brush" are fully deployed. Energy grows on trees and in other biomass so rapidly that humans waste much time and energy "clearing land" of nature's energy bounty. It remains to be seen if the Keystone XL pipeline can ultimately provide more net energy than the energy put into building it PLUS the clean energy destroyed to clear the way for it, MINUS the energy required to make liquid fuels from tar sands. Pipeline profitability originally based upon $100 per barrel oil leaves at least some room for doubt. 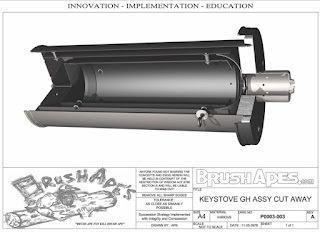 Political banter over the Keystone XL pipeline was the inspiration for the KeyStove LX, an early dive into small and affordable clean kiln design. 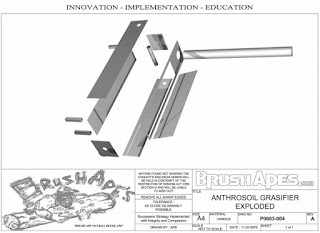 Fabrication details were released to instructables December of 2011. The design became an instructables of the month award winner! 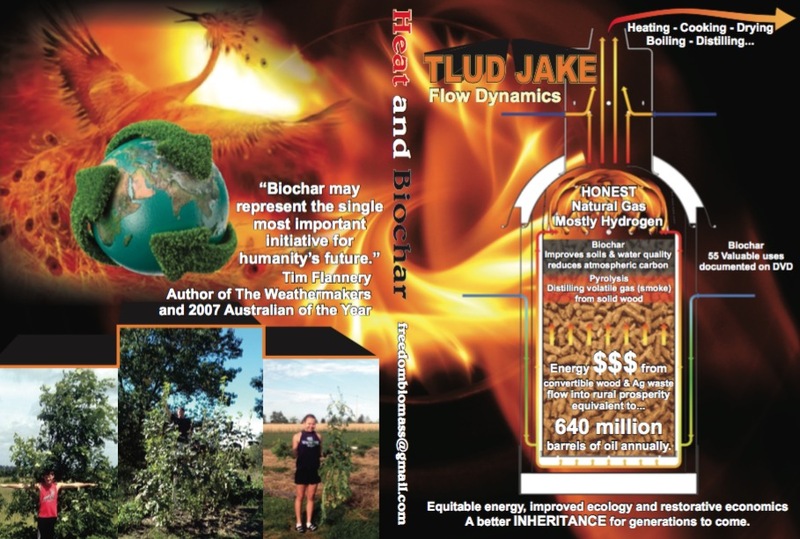 The flow diagram graces the Heat and Biochar DVD cover, with complete engineering drawings of suggested hole locations, and videos of working models doing useful work, like boiling water. 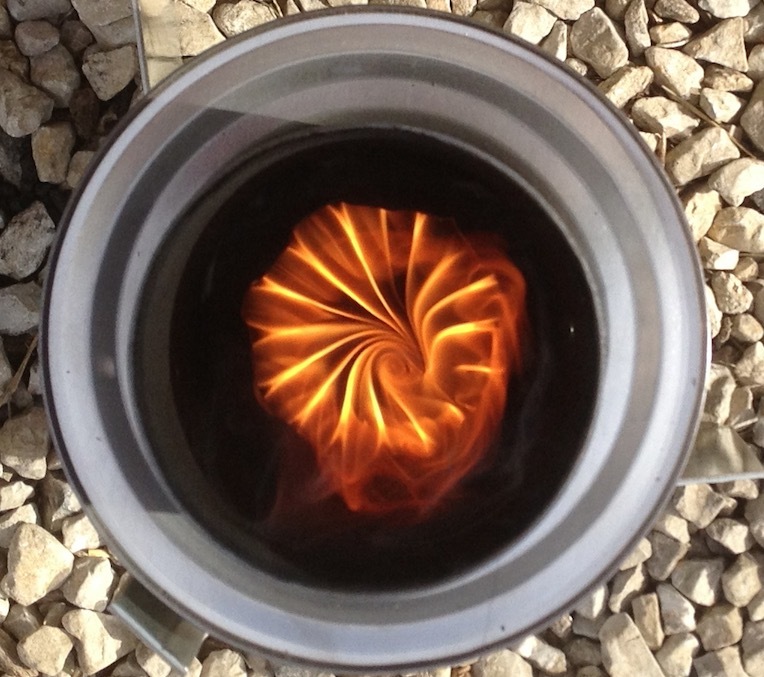 Infamous KeyStove LX "vortex swirl" flame. 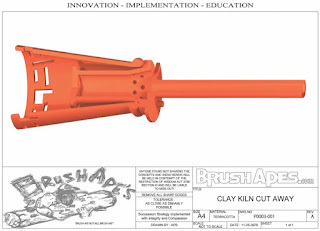 For those desiring something simpler, more flexible in design, and able to be fabricated in parts of the world without coffee serving pots - a clay kiln. 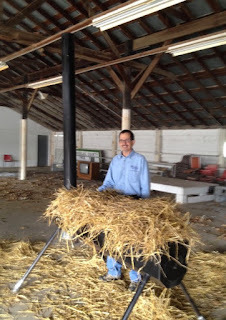 Wheat straw, cornstalks, cobs, bamboo, and tall stemmy grasses are a widely distributed, under-utilized biomass to biochar plus energy resource. 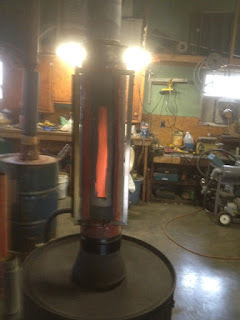 The photo shows using the process heat for drying the next batch. The wheat straw had been rained on during transport and needed to be dried to run smoke free. The GH is a larger design following the principles of the KeyStove LX but with higher heat output and an extended run-time of 8 hours. The larger size allows a good nights sleep with the kiln running unattended. 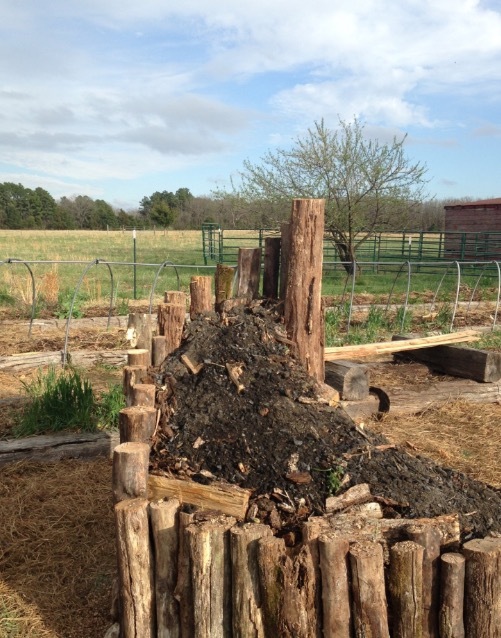 The process creates over 100,000 btu plus more than a gallon of high quality biochar per cycle. 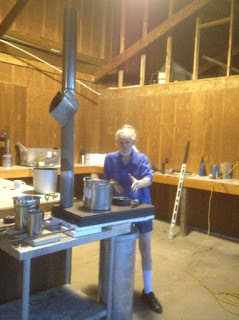 Biochar guru David Yarrow demonstrates "cooking with flue gas"
A GH cooked a hot meal every day for a group of 12 at a bio-energy/biochar camp. 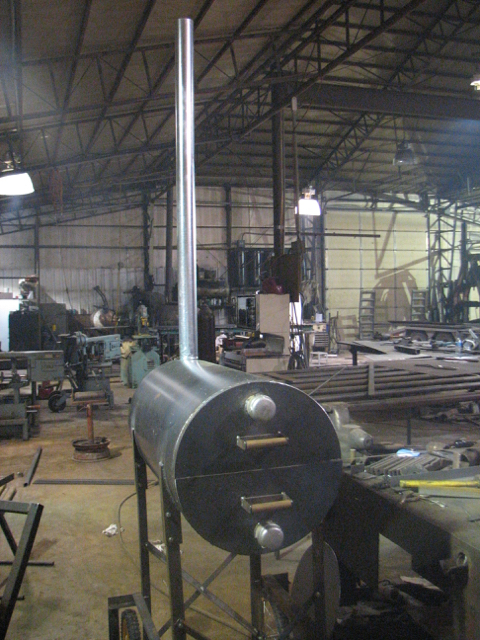 JAKE is a compact clean kiln design in 1,2, and 3 foot lengths with attendant 4-8-12 hours of runtime producing combined heat and biochar. Load hardwood pellets, small twigs, etc into an 8" tube- 10" diameter combustion chamber, light it on top, and get plenty of heat for cooking meals or boiling water with no smoke and a nice bonus of high quality biochar! 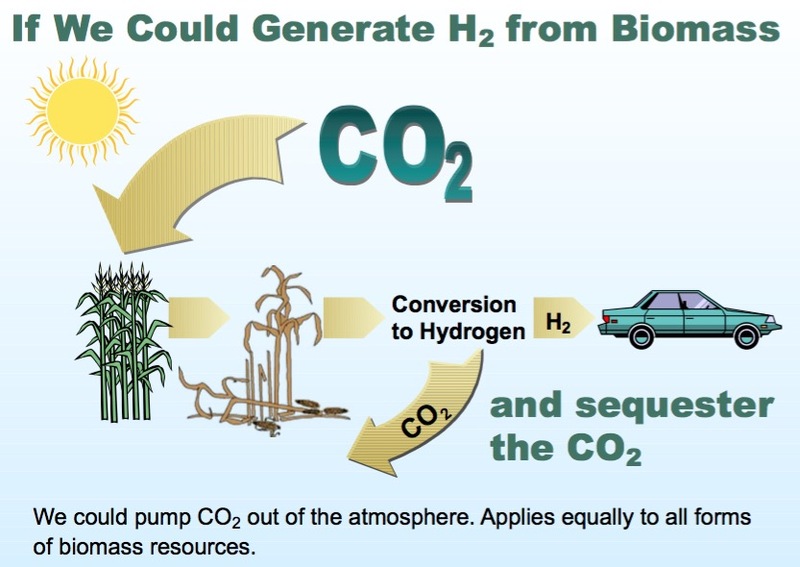 Fast-growing biomass takes up more carbon than any other process and yields oxygen. 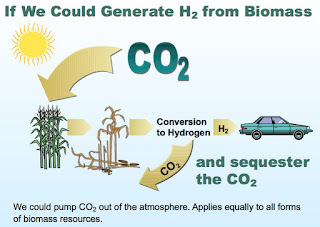 In taking into account the total fuel cycle, several studies show that biomass energy is the only option that has a net gain over the carbon/oxygen cycle. Planting trees can reverse the CO2 buildup faster than any other means, and young forests fix more carbon than mature forests. 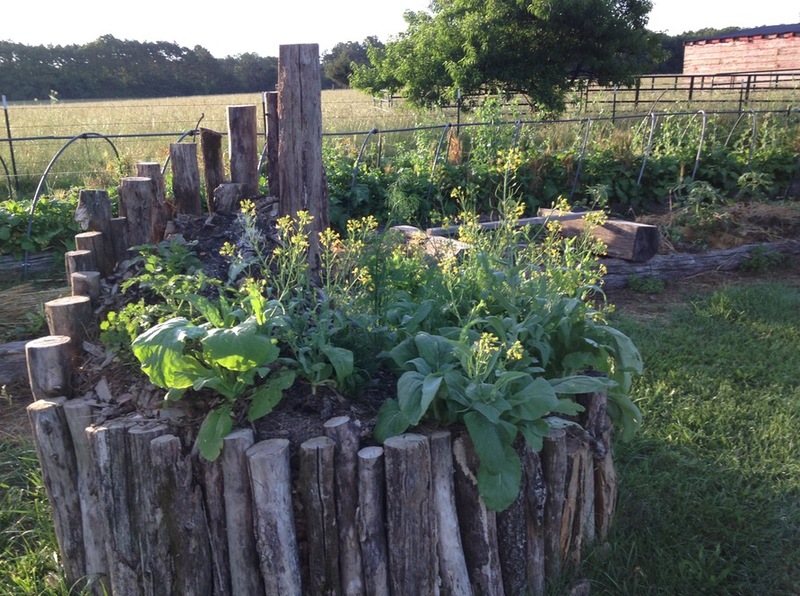 Woody plants capture more sun and are more efficient than annual crops in temperate climates. Woody crops actually fix over three times more carbon per field per year than a single crop of corn. Biochar soil improvement reduces atmospheric carbon at an even faster rate than envisioned at the time these reports were published. More extras including diagram of the "dasifier" metal melter design by Agua Das, videos of a lawn mower, a tractor, a home generator, and a Toyota pickup powered by gasified biomass, far too much to try to summarize in a blog post! "Make Smoke, Burn Smoke" - A $12.95 value included free! This is a full color digital version of the original paperback by Doug Brethower with creative commons licensing - share parts as you will, with attribution to the source. "Clean, Sustainable Home Electric Power.. 8 Hours After the Grid Goes Down, Using Only Local Materials" - a presentation prepared by Doug Brethower for a Mother Earth News fair in Topeka KS that included a live demonstration with pictures of the trial run of the demo. Will the light come on before "lights out"? 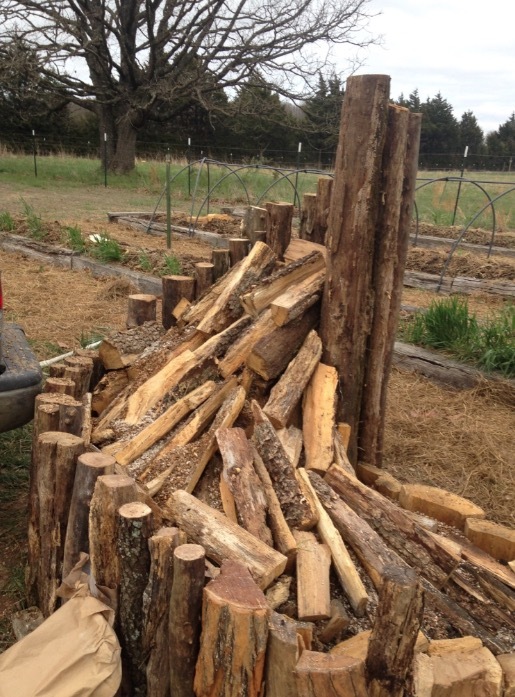 Biomass energy is not just for emergency preparedness. It is an abundant, long term sustainable, environmentally responsible energy source provided by the daily passage of the sun overhead. Smoke is a gas! The DVD along with some elbow grease is a great way to understand the basics. 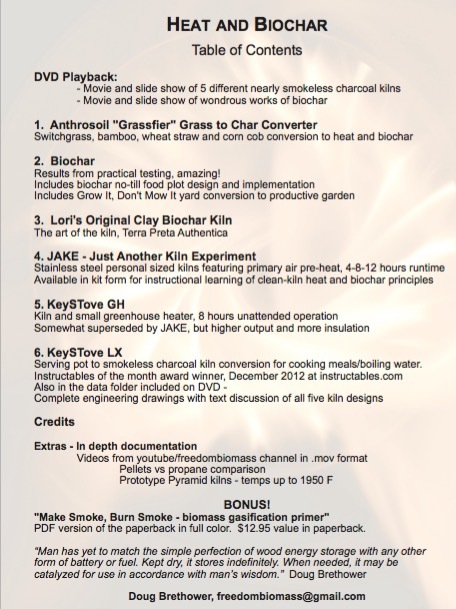 Heat and Biochar DVD - Money back satisfaction guarantee. Buy with confidence! This evening, assembled a new vacuum cleaner, hung a paper towel rack, replaced a toilet seat for an elderly widow. Less than half an hour for us. Past weeks, been building shelter for a homeless women from "obtainium" in the shortening days. All in need with a project ready to go, just waiting on brushape muscle and/or know how, particularly widows, orphans, homeless, please contact us. We endeavor to serve those in need. "We tell the government officials that we can provide more power than they need, at a tenth of the cost of the oil, and we can do it from feedstocks they consider wastes, and we can use processes that net sequester greenhouse gases at each step, with a lifecycle cost that is high in the black, low capital outlay and quick return on investment. Oh, and it arrests global warming, deepens soils, saves water and increases biodiversity. Surely we are trying to sell them snake oil, what we propose is illegal, or there is some neglected externality in our calculus that makes our proposal fall apart once exposed to serious scrutiny.” -- Albert Bates, "The Biochar Moment"
Biochar is a win-win-win, for energy, for environment, for economy. "But as I've studied biochar, it's the only thing I've seen with no downside. Nothing! And that's very exciting to me." Biochar is pure natural charcoal made exclusively from above ground biomass resources with no added ingredients. Biomass is wood, straw, stalks, stems, cobs, husks, hulls, pits, etc. When biomass is heated to a point where all that remains is the black carbon that previously formed the main structure of the biomass, bingo, charcoal. 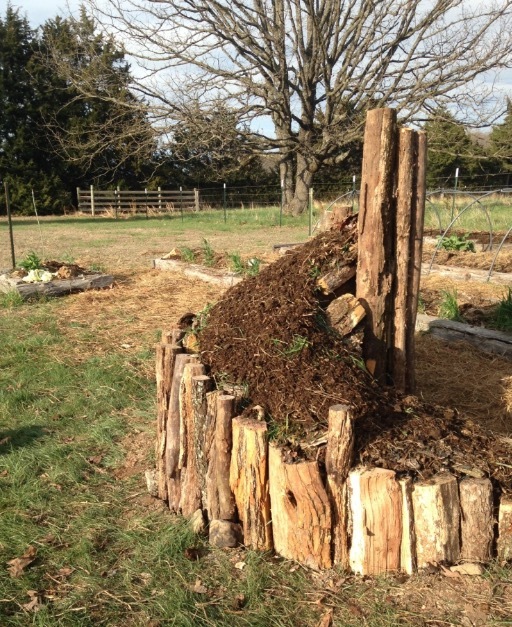 When this natural charcoal is applied into the soil for soil improvement and carbon sequestration it officially becomes "biochar". Dr. Karl Frogner of the Ulaanbaatar Biochar Initiative estimates almost a ton per acre of excess biomass from mixed maize, rice and agroforestry small farms (7-10 acres). 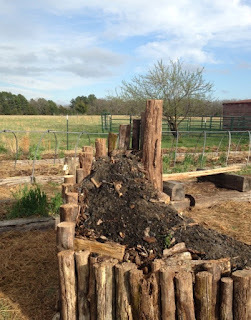 After deducting the energy stored in biochar produced, the btu equivalent of about 100 gallons of propane per acre is available as current carbon cycle, non-fossil energy. 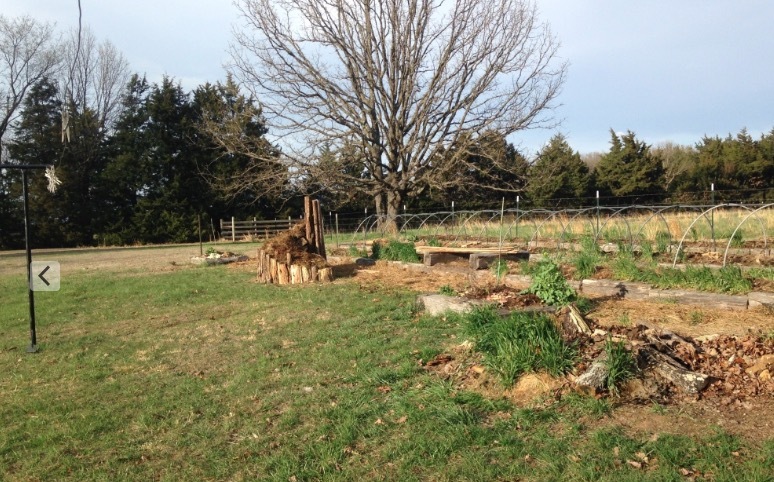 As the biochar is soil applied, about a half ton per acre of atmospheric carbon is sequestered for hundreds to thousands of years. This pure natural charcoal has no resemblance to most commercial bagged charcoal for grilling. Never apply bagged charcoal briquettes to the soil! They are not even similar products. Pure natural charcoal has many uses besides soil improvement, with centuries of traditional use in medicinal, veterinary, odor control, liquids filtration and de-contamination applications. Hans-Peter Schmidt writing for the ithaka journal describes 55 modern and past uses. Pure natural charcoal has also been "gasified" in onboard "producer gas" systems for vehicle power, most notably in WWII Europe during petroleum fuel shortages. 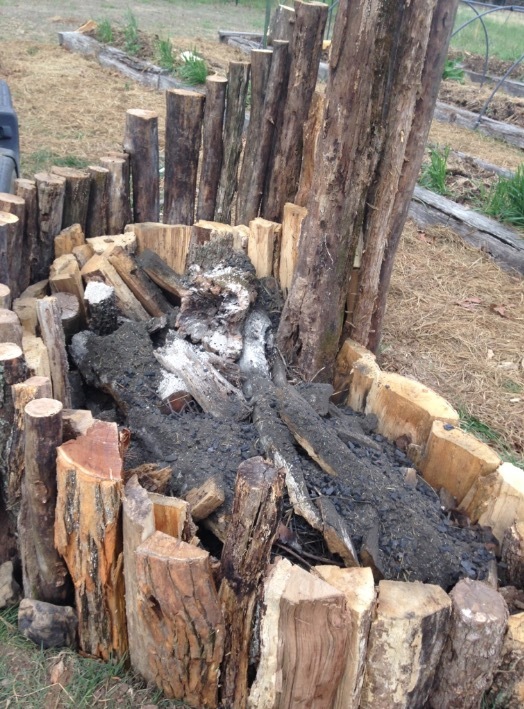 Natural charcoal can be obtained as easily as scraping the black chunks off partially burnt pieces of wood - right on up to as complex as anyone can dream up. Charcoal kilns have been developed over the years at various scales and purpose. 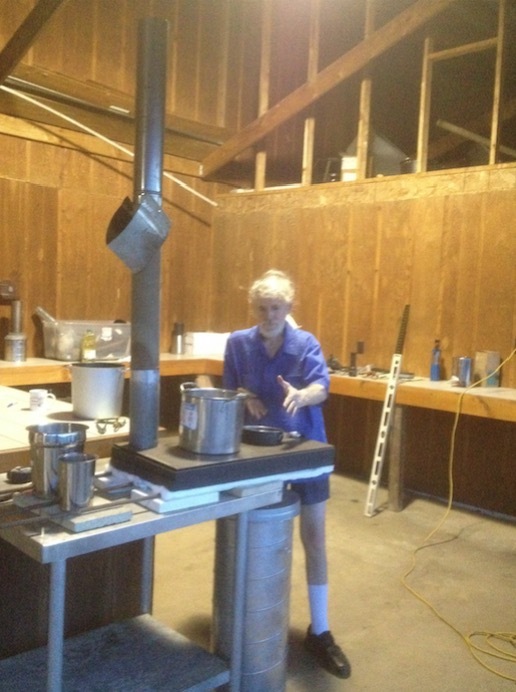 A fairly recent innovation is micro-gasification cookstoves. 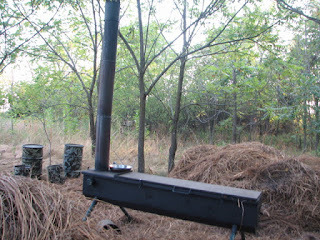 These devices, use only the energy already contained in the biomass, to make smoke, burn the smoke and save the charcoal. 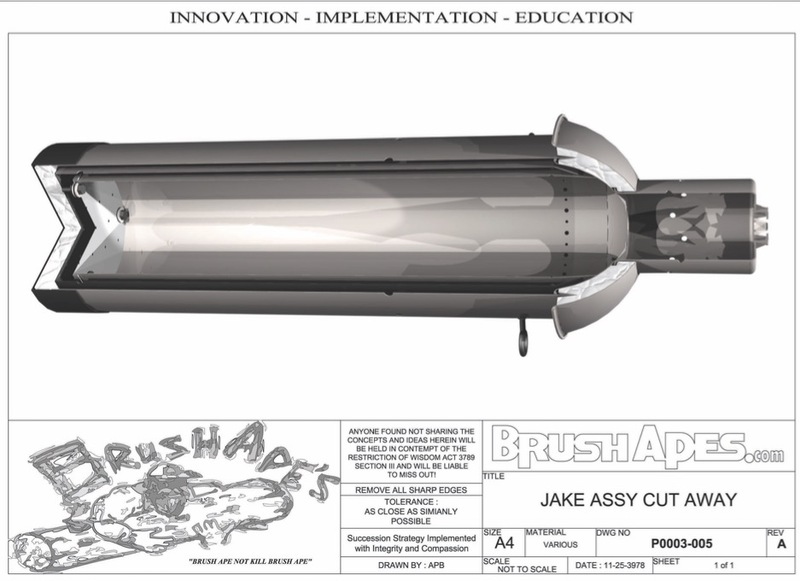 More detailed info on the concepts and applications are in the book "Make Smoke, Burn Smoke". In practical application, positive economic and environmental impacts are noted, "a business solution to poverty award winner". 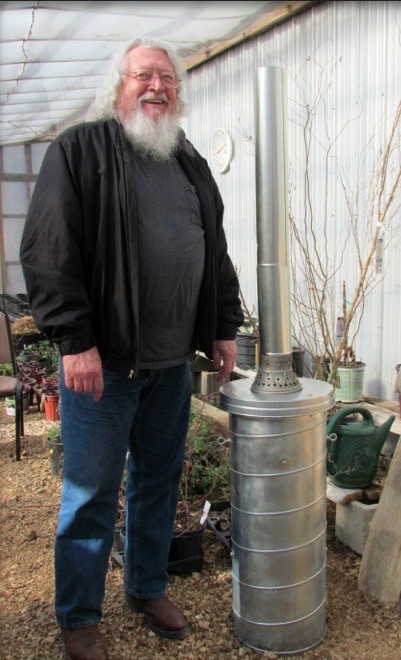 In the early days of small scale biochar production, a fellow "stover" (clean cook stove builder) opined that "biochar kilns are a lot like snowflakes, no two alike". 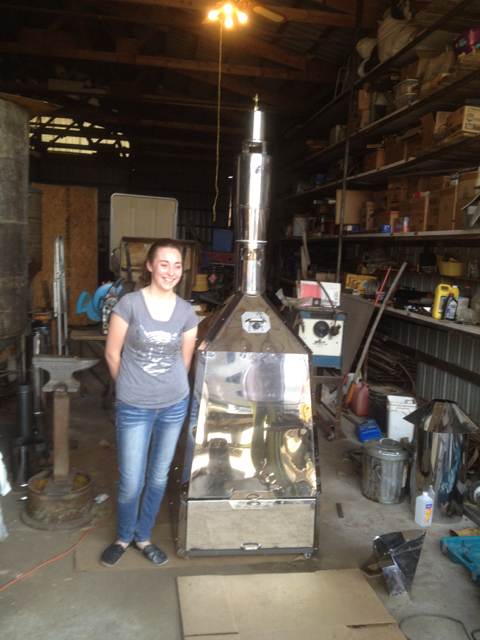 Kilns were fashioned mostly from "obtainium" by those knowledgeable in the basic engineering principles. 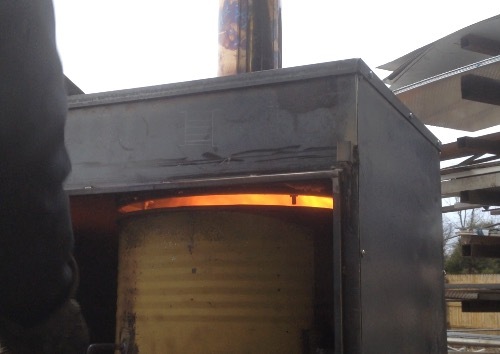 For simple micro-gasifiers, the "feedstock", the biomass to be charred, drives the design. Beyond that usability, and making use of the "waste heat" are additional considerations. 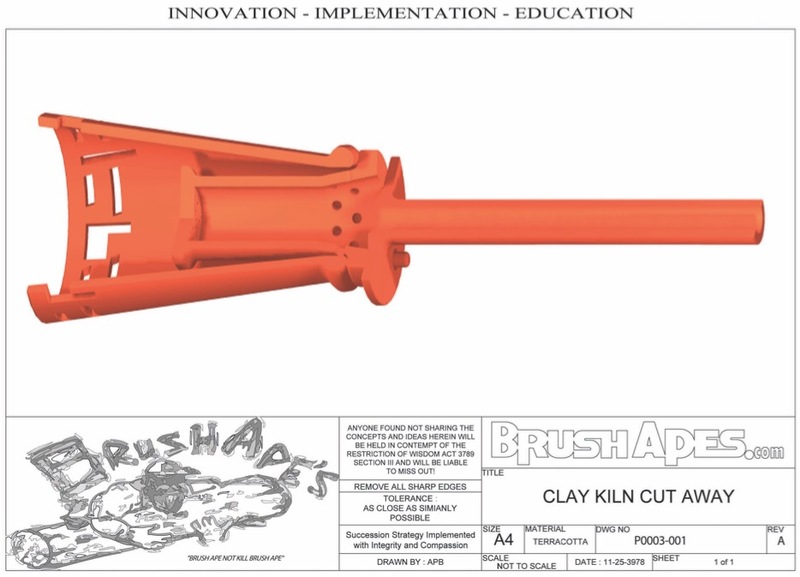 The simplest tool that will do the job is THE design pattern in brushape circles. Listed in chronological order, from earliest to latest designs. Natural charcoal is not all created equal. Various biomass feedstocks have varying pore spaces and shapes. Grass/straw/stalks generally do not char well in kilns designed for charcoal production from wood. A University of Hiroshima study discovered that bamboo charcoal holds almost 5 times as much water as hardwood charcoal. 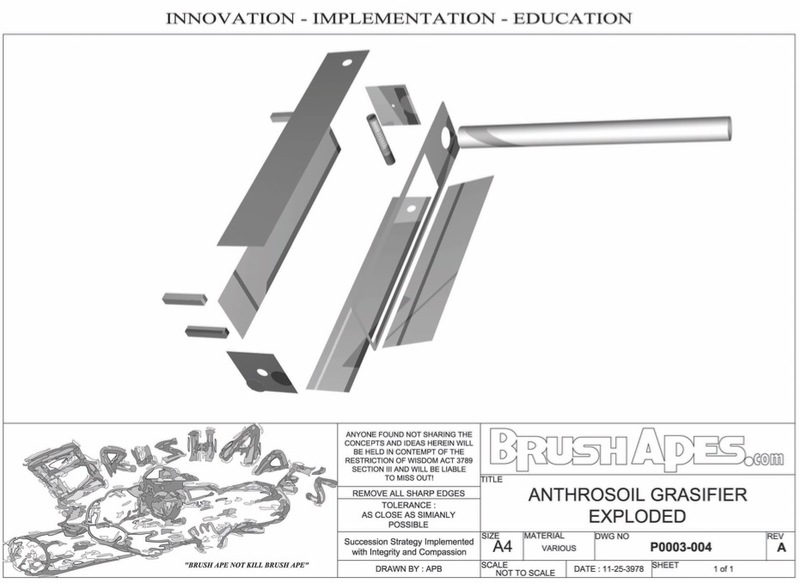 "..bamboo is in a class by itself in the charcoal world - its ability to store water is tremendous"
The anthrosoil was developed to convert grassy feedstocks into biochar. 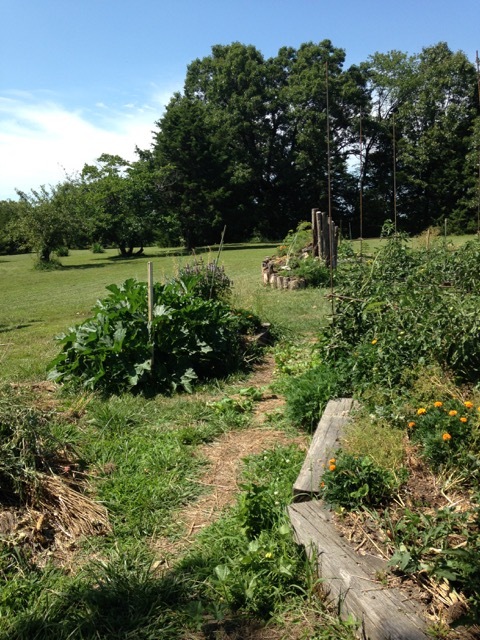 It works well across a variety of grasses including wheat straw, switchgrass, corn stalks and bamboo. 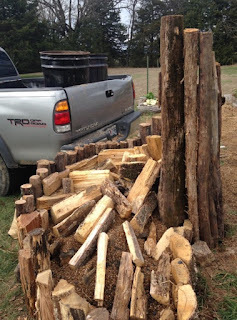 In real world use it has even been used to char 2x4 wood scraps by a knowledgeable user. 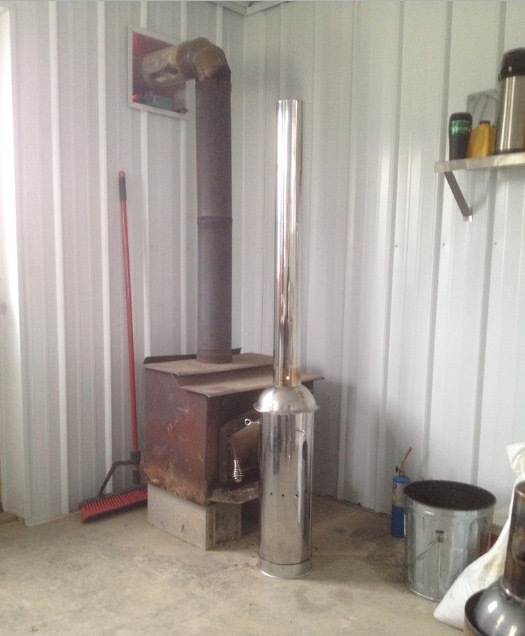 The shiny thing near the chimney is a skillet. Cooking supper while charring switchgrass, delicious. Had been looking for someone to build a biochar kiln in clay. Lori, a local art teacher made one for me, one for her, and had her entire class make them as an art project. She said the ugliest one in the class burned the cleanest. (Engineers don't make the best art students?) 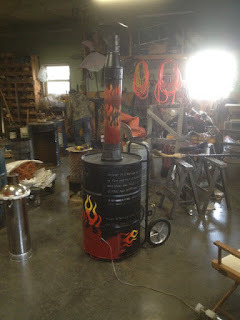 Her design not only looked beautiful, but made a very interesting thin line of flame and ran plenty clean enough for space heat in her drafty garage/art studio. The clay throws wonderful radiant heat. 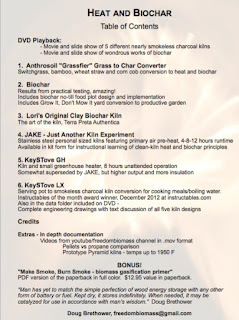 The KeySTove LX design was publicly released to instructables and won the "instructables of the month" award in December 2011. The name came from discussion with a fellow stover as the Keystone XL pipeline tar sands plumbing project was in the news. He said "you know they will probably waste more energy clearing and burning the right of way than the net energy that will ever come out of it". Tar sands have an incredibly low rate of energy return on energy invested (EROEI), requiring $100 per barrel oil to turn a profit. Besides open sourcing the design to instructables, also built several hundred of these for friends and eventually for sale. "The vortex swirl" was fun to watch, and creates turbulence. The three T's of clean combustion are time, temperature and turbulence. With the small combustion chamber, the time was not much, but insulation and swirl made up for it in a very clean stove that saved "biochar". The KeySTove LX had an operating time of about 90 minutes on small twigs, with enough power to cook a meal or boil a pot of water. 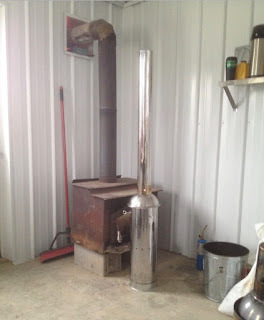 A larger version dubbed KeySTove GH (GreenHouse version) reliably operated at about 50% greater output for 8 hours on 10 pounds of hardwood pellets. 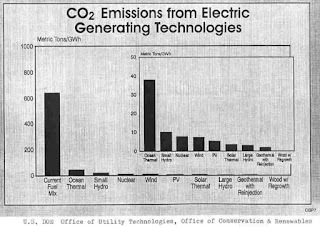 Perfect combustion releases mostly carbon dioxide (the same thing animals breathe out) and water, both great for greenhouse plants. 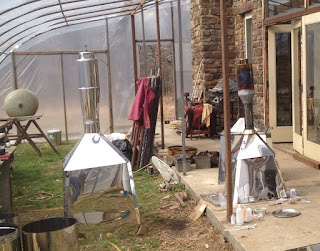 "Just Another Kiln Experiment" and the first name of the fabricator that supplied the stainless steel tubes. The tubes were being made for chimney vent pipes. 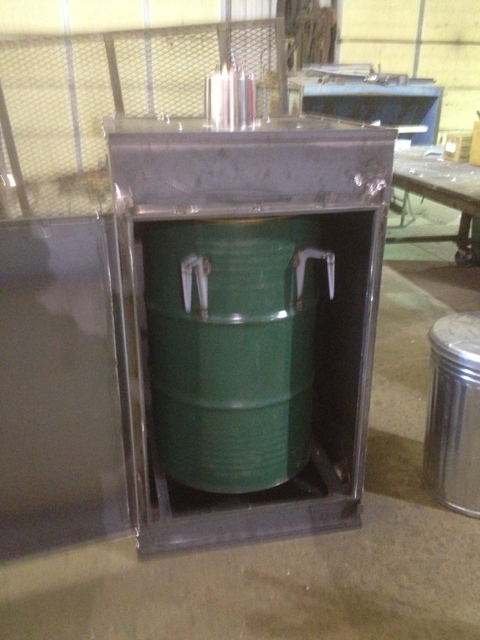 The kiln is produced in 1foot, 2 foot and 3 foot versions that all operate at the same power. The one footer runs 4 hours, 2 footer 8 hours, and 3 footer 12 hours on a charge of hardwood pellets. The output besides heat is beautifully uniform charred pellets. 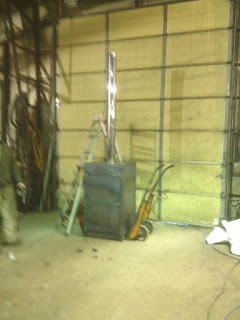 A full load in the two footer is about 10 pounds. The one foot version is my current personal choice for a clean char making stove/heater. It is small enough to pack easily, has plenty of output to cook and heat. Jake replaced his wood burning stove with a JAKE char maker for one heating season in his office where doors to the outside and into the shop were frequently opened. While he liked the heat and the char, his white metal ceiling acquired a patina of black soot. 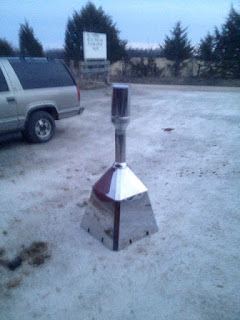 Soot collector/burner caps were then designed and used on the higher end pyramid kilns. See below. 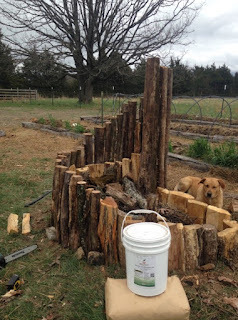 Not long after we started building these, a professional grower relayed a bit of wisdom. The term pyramid literally means "fire in the middle". The pyramid shape in limited testing seems to have amazing potential. 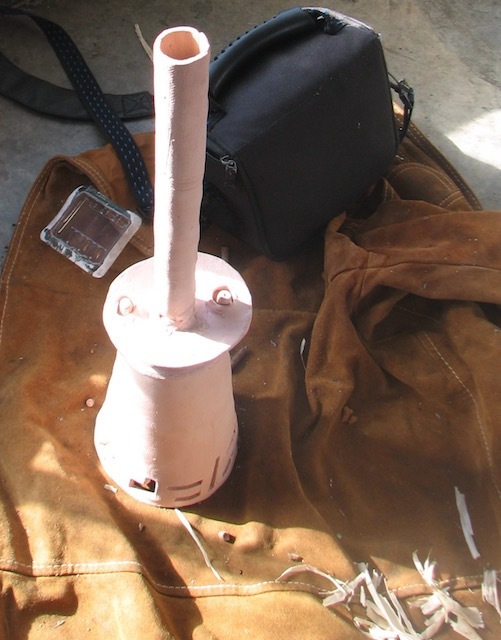 In one test in a humid greenhouse setting the chimney began to roar and turned bright red. A kid walking by asked "what are you burning in that thing, rocket fuel?" 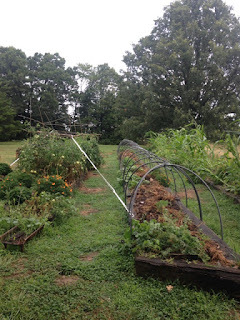 The most logical explanation is that with the high humidity in the greenhouse getting higher as the kiln ran, some kind of dissociation of water into hydrogen and oxygen was happening in the humid environment. Then the molecules re-combined in the flare. Anyone who has cut metal with an oxygen torch can relate. We have built and tested a few of these, but not nearly enough to explore the potential. A noticeable side effect was that when soot collection was added, the temperature in the soot collector chamber (1950F) was higher than in the combustion chamber (1350F). The stainless steel soot collector immediately "blued". In the pyramid shape, time, a key design element for clean combustion, becomes an ally. 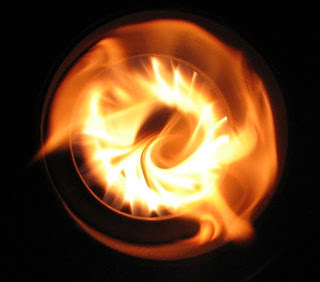 Both residence time in the combustion chamber, and residence time in the even higher temperature of the soot collector aid the the other two T's of combustion, temperature and turbulence. In parallel time frame of pyramid kilns, an aquaponics client asked for an inexpensive long duration kiln with high btu output. 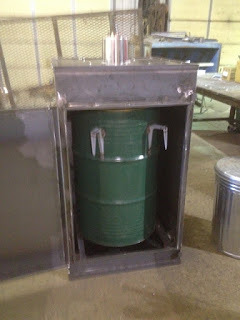 55 gallon (200 liter) drums were used for the fuel cell, with a housing built around them. Over 100,000 btuh output and they ran mostly smoke free across a wide range of "waste" biomass feedstocks. Some folks are looking for commercial products. 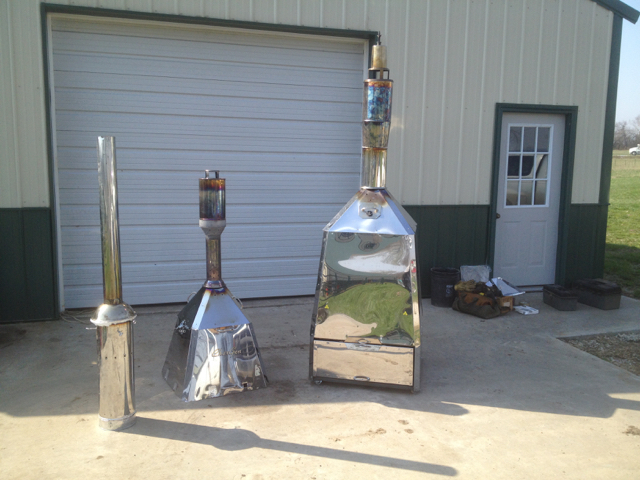 Brushapes just have fun fabricating innovative biochar kilns. 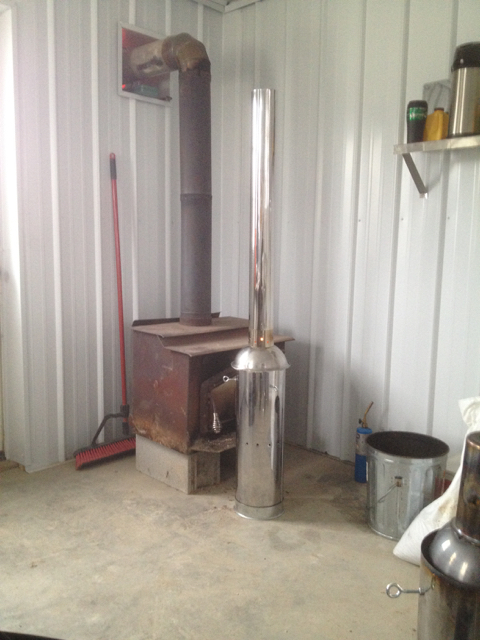 The clean heat and biochar are a bonus. In a win-win-win scenario, all is a gain.